View from mountain to mountain in the 1850s. NEXT Saturday, there will be a race up a mountain in the Bau District; this is not an ordinary mountain but one with historical importance. The Persatuan Asal Serambu Bau (PASB) and the Brooke Heritage are the organisers of this competition. Have you registered as a competitor? Don’t miss the chance of a lifetime. The winners of the race will be awarded some prizes and their names will be associated with a mountain on which was built some 170 years ago a bungalow by the first English Rajah of Sarawak, James Brooke. 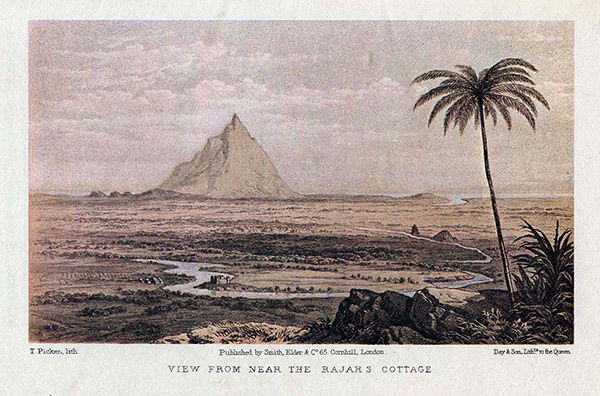 According to Spenser St John, biographer of the Rajah, the spot was formerly “a Dayak village, but the inhabitants removing to join another section of their tribe who were in a more sheltered spot, Sir James purchased the fruit trees around, and built a pretty cottage there”. Local History buffs, me included, longing for the news of further developments to the proposals made by some people in the tourism industry two years ago to erect on the same spot a new house and to call the path up the mountain ‘The Wallace Trail’, are excited about the event. There appears to be a renewed interest in the projects. We wish the organisers of the first Climbathon every success. The history of the mountain is well documented. There are always legends associated with mountains and Bung Muan is no exception. Let members of the PASB write down anything that they know from their elders about the place. The information will be good for visitors. Schools should organise trips for their students; that would be educational indeed. Besides James Brooke, two other Englishmen made the mountain famous – Spenser St John and Alfred Russel Wallace. Wallace, co-founder with Charles Darwin of the Theory of Evolution, had been in Sarawak for about two years since November 1854. He was invited by the Rajah to his cottage Peninjau halfway up the Sirambau for a week. “as a very steep pyramidal mountain of crystalline basaltic rock, about a thousand feet high, and covered with luxuriant forest. “There are three Dyak villages upon it, and on a little platform near the summit is a rude wooden lodge where the English Rajah was accustomed to go for relaxation and cool fresh air. “The road up the mountain is a succession of ladders on the face of precipices, bamboo bridges over gullies and chasms, and slippery paths over rocks and tree-trunks and huge boulders as big as houses. A cool spring under an overhanging rock just below the cottage furnished us with refreshing baths and delicious drinking water. So fascinated was Wallace with the place that soon he returned to the mountain, this time taking with him two companions – Charles Allen and Ali – to help him catch more butterflies and insects to take back to England. He noted that “… during the whole of my eight years’ wanderings in the East I never found another spot where these insects were at all plentiful”. Spenser St John mentioned the name of Mita as a leader of the Dayaks at Sirambau at the time. Who and where are Mita’s descendants? Any one of them would be the real Asal Serumbu. There must also be descendants of others somewhere – those who had lived in the three longhouses. Put up your hands and identify yourself on Saturday. How about the trail and bungalow projects? About those projects – the Bungalow and the Trail; are these projects still on? I understand that a structural plan of the building has been completed. When will the construction start? There has been total silence on this matter. What’s holding it up? Lack of money, or of political will, or has the mountain been licensed out for another quarry? I’m not recommending a heritage project solely for tourism purposes. That, if it happens, will be a bonus. It will make some money if run properly but a landmark of historical value is more than that; it provides a sense of identity and continuity of a civilisation of a community. While we are still on the mountain, I’d suggest to set aside a room inside the bungalow for books, documents and artefacts relating to the history of the mountain. Or, for better custody, have a small ‘Serambu library’ in the village itself. Here Brooke Heritage, I’m sure, would be of immense help in supplying the necessary replicas of artefacts and copies of documents available in England. Among the many books on historical landmarks, two books are a must for that library: ‘The Malay Archipelago’ by Alfred Russel Wallace and ‘Life in the Forests of the Far East’ (Volumes 1 and 2) by Spenser St John. I assume that the tourism ministries (state-federal) have been working together with the PASB and the Brooke Heritage on the projects. It’s important that the benefits of any economic venture be equitably shared among the locals, especially the descendants of the original inhabitants of the three villages. That will give them a sense of belonging; their cooperation is vital if the projects are to succeed and to last long.